Bradford's Peel Park and its carefully curated landscape is a public space usually quietly appreciated only by locals and those with a keen interest in Victorian landscaped gardens. Well, that was until 7 January 2017, when it hosted the 2017 HSBC National Cyclocross Championships, the first major sporting event of the year. All of a sudden this sculpted landscape was webbed with kilometres of tape and mesh following the many contours and off-camber banks as it became the home to the biggest cyclocross race in the country (after the MK world cup of course) for the weekend. In the words of course director Phil Ingham: “If you were to purposely build a venue to hold a cyclocross race, this landscape and typography is what you’re looking for.” Despite a unseasonably dry winter in Yorkshire, the course was as muddy as you would expect at a CX race and incredibly slippery. 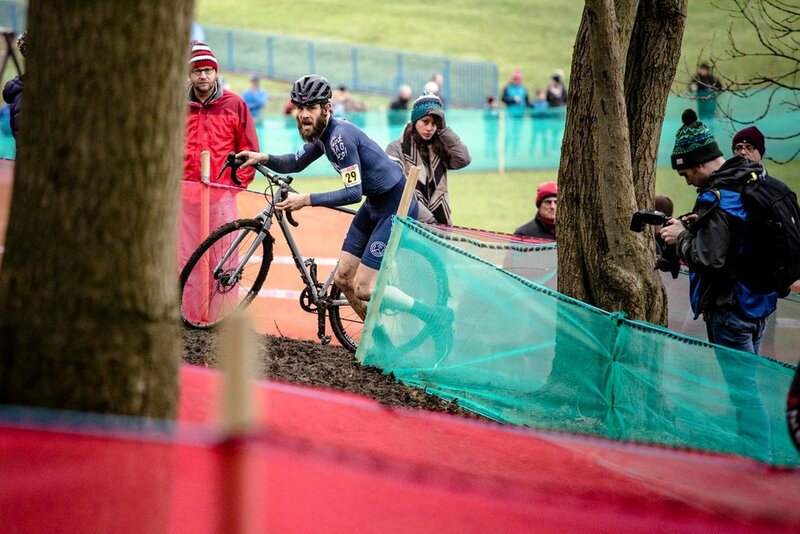 Despite - or perhaps because of - the course being technically demanding, testing riders to their limits and demanding full use of their bike handling skills, there were swathes of cross racers lined up to commence battle. 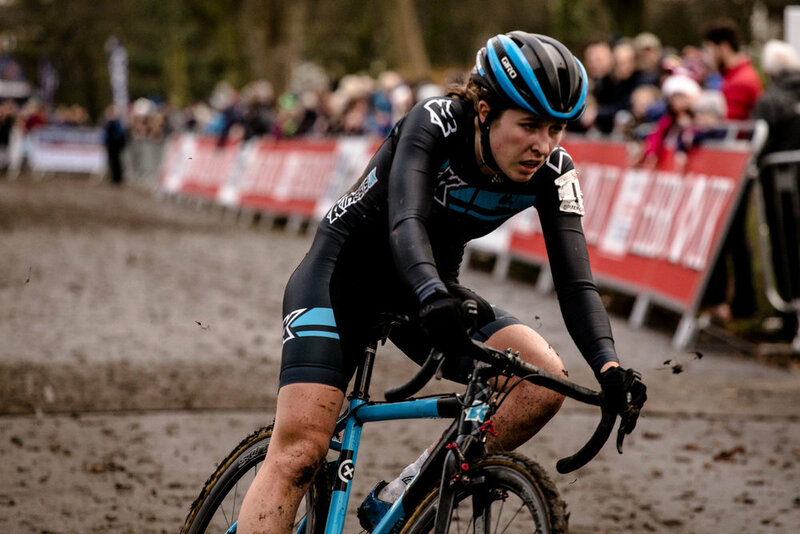 British riders have been having great success across the board in cyclocross: Tom Pidcot, European junior champion, and Evie Richards, under-23 world champion, lined up alongside various vet category world CX champions and recent National Trophy series leader Hannah Payton. Ian Field was present with no intention of losing out on a national title to rival Liam Killeen - the current national champion looking to make good on his previous year to retain the national champs jersey. Nikki Brammier was also looking to retain her national title and wasn’t showing any sign of complacency knowing how strong the women field has become in recent years despite the absence of Helen Wyman. As we have come to expect from Yorkshire bike races, the crowds were out in force and the clattering of cow bells echoed across Bradford throughout the weekend. The technical sections became several people deep as cyclocross fans gathered to critique the riders as they picked their lines, committing to the ruts (of which there were plenty). Tom Pidcot showed his dominance in the British junior men's race, opening up an incredible gap to chasing Ben Turner (HMT with JLT Condor) and Dan Tullet (Specialized Racing). In the men's under-23 category, local boy Billy Harding (Oldfield/Paul Milnes) came from 10 miles down to road to walk away a national champ as the cheers echoed. Amira Mellor showed her hunger for gold as the under-23 women got underway but the world champion’s jersey of Evie Richards kept slipping away. Evie showed her incredible form to demonstrate the kind of ride it takes to secure the rainbow strip (and the national stripes for that matter). For Nikki Brammier (Boels-Dolmans) in the elite women's race, this was unknown territory as she'd not ridden a cyclocross race on UK soil and was also returning from injury at the World Cup. Despite valiant attacks from Bethany Crumpton (Beat Out Breast Cancer) and Hannah Payton (Team Kinesis UK), Brammier continually applied the pressure building a staggering two-minute lead over Payton to secure her second national title. As the light began to fade, tensions rose throughout Peel Park as the crowds focused on the elite men's race as Ian Field (Hargroves - Ridley - Montezuma RT) glided seamlessly around a course that was swiftly taking casualties behind him. Field only occasionally glanced behind to check on his rival Liam Killeen (Malvern Cycle Sport), who was determinedly chasing him down but it the end it wasn’t enough. Ultimately, Field wanted the race more than anyone else. He crossed the line showing only signs of relief as he took the elite men's title for a remarkable fifth time.